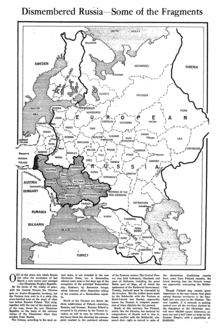 ^ 2.0 2.1 Bullock, p. 7 "Peripheral regions of the former Russian Empire that had broken away to form new nations had to fight for independence: Finland, Poland, Estonia, Lithuania, Latvia, Belarus, Ukraine, Georgia and Azerbaijan." ^ 3.0 3.1 G.F. Krivosheev, Soviet Casualties and Combat Losses in the Twentieth Century, pp. 7–38. ^ Read, Christopher, From Tsar to Soviets, 牛津大学出版社 (1996), p. 237: By 1920, 77% of the Red Army's enlisted ranks were composed of peasant conscripts. ^ Williams, Beryl, The Russian Revolution 1917–1921, Blackwell Publishing Ltd. (1987), ISBN 978-0-631-15083-1, ISBN 978-0-631-15083-1: Typically, men of conscriptible age (17–40) in a village would vanish when Red Army draft units approached. The taking of hostages and a few exemplary executions usually brought the men back. 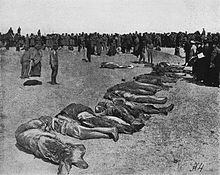 ^ 6.0 6.1 Orlando Figes, A people's tragedy – History of the Russian Revolution (Penguin Books 1996): To mobilize the peasants Kolchak's army resorted increasingly to terror. There was no effective local administration to enforce the conscription in any other way, and in any case the Whites' world-view ruled out the need to persuade the peasants. 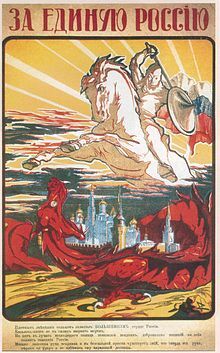 It was taken for granted that it was the peasants place to serve in the White army, just as he had served in the ranks of the Tsar's, and that if he refused it was the army's right to punish him, even executing him if necessary as a warning to the others. Peasants were flogged and tortured, hostages were taken and shot, and whole villages were burned to the ground to force the conscripts into the army. Kolchak's cavalry would ride into towns on market day, round up the young men at gunpoint and take them off to the Front. Much of this terror was concealed from the Allies so as not to jeopardize their aid. But General Graves, the commander of the US troops, was well informed and was horrified by it. As he realized, the mass conscription of the peasantry 'was a long step towards the end of Kolchak's regime'. It soon destroyed the discipline and fighting morale of his army. 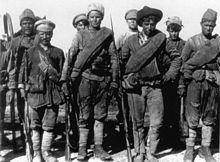 Of every five peasants forcibly conscripted, four would desert: many of them ran off to the Reds, taking with them their supplies. Knox was livid when he first saw the Red troops on the Eastern Front: they were wearing British uniforms. 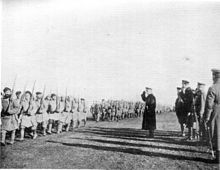 From the start of its campaign, Kolchak's army was forced to deal with numerous peasant revolts in the rear, notably in Slavgorod, south-east of Omsk, and in Minusinsk on the Yenisei. The White requisitioning and mobilizations were their principal cause. Without its own structures of local government in the rural areas, Kolchak's regime could do very little, other than send in the Cossacks with their whips, to stop the peasants from reforming their Soviets to defend the local village revolution. By the height of the Kolchak offensive, whole areas of the Siberian rear were engulfed by peasant revolts. ^ Overy, R.J., The Dictators: Hitler's Germany and Stalin's Russia, W.W. Norton & Company (2004), ISBN 978-0-393-02030-4, ISBN 978-0-393-02030-4, p. 446: By the end of the civil war, one-third of all Red Army officers were ex-Tsarist voenspetsy. ^ 29.0 29.1 Smith, David A.; Tucker, Spencer C. Faustschlag, Operation. World War One. ABC-CLIO. 2005: 663. ISBN 1851098798. ^ Haupt, Georges & Marie, Jean-Jacques. Makers of the Russian revolution. London: George Allen & Unwin: 222. 1974. ^ Daniels, Robert V., A Documentary History of Communism in Russia: From Lenin to Gorbachev, UPNE (1993), ISBN 978-0-87451-616-6, ISBN 978-0-87451-616-6, p. 70: The Cheka special investigations forces were also charged with the detection of sabotage and counter-revolutionary activity by Red Army soldiers and commanders. ^ Generalkommando VI Reservekorps. Axis History. ^ Rosenthal, Reigo. Loodearmee (Estonian language/Northwestern Army). Tallinn: Argo. 2006: 516. ISBN 9949-415-45-4. ^ Bolsheviki Grain Near Petrograd. New York Tribune (华盛顿). 美国国会图书馆. 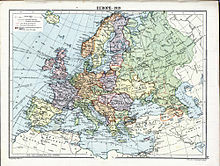 15 November 1919: 4 [10 September 2010]. ^ 46.0 46.1 P. and Coates, Soviets in Central Asia, 76. ^ Urlanis B. Wars and Population. 莫斯科, Progress publishers, 1971. ^ Robert Gellately. Lenin, Stalin, and Hitler: The Age of Social Catastrophe Knopf, 2007 ISBN 978-1-4000-4005-6 pp. 70–1. ^ Kenez, Peter; Pipe, Richard; Pipes, Richard. The Prosecution of Soviet History: A Critique of Richard Pipes' The Russian Revolution. Russian Review. 1991, 50 (3): 345–51. JSTOR 131078. doi:10.2307/131078. .
^ Holquist, Peter. 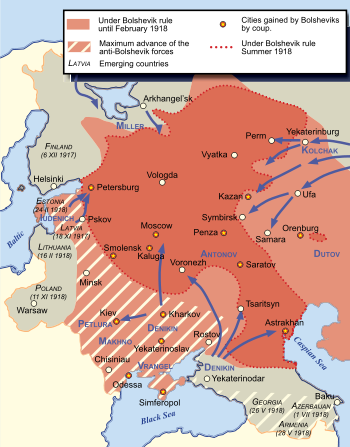 Making War, Forging Revolution: Russia's Continuum of Crisis, 1914–1921. Cambridge: 哈佛大学出版社. 2002: 164. ISBN 0-674-00907-X. .
^ Колчаковщина. RU: Cult Info. （原始内容存档于2005-05-10） （俄语）. .
Peter Kenez. Civil War in South Russia, 1918: The First Year of the Volunteer Army, Berkeley, 加利福尼亚出版社, 1971. Peter Kenez. Civil War in South Russia, 1919–1920: The Defeat of the Whites, Berkeley, 加利福尼亚出版社, 1977.